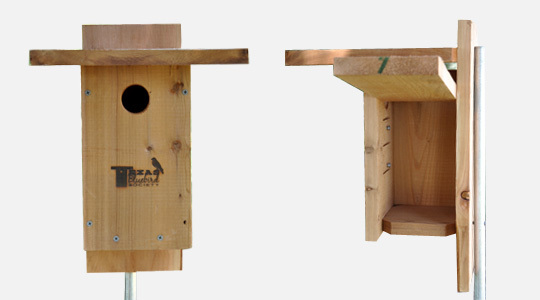 Purchase the Official Texas Bluebird Society Nestbox! Help our native cavity-nesting birds by installing an Official Texas Bluebird Society (TBS) nestbox on your property. This nestbox is designed to meet the demands of the Texas environment and will last for many years! The inside front includes kerfs to assist the fledglings reaching the door hole and screws for attaching a Van Ert trap to assist with House Sparrow control. Inside dimensions: Roof->Floor: 9.5", Inside: 4.5"x4.5", Door hole->Floor: 6.75"
$139 incl. tax and S&H. $114 incl. tax and S&H.